Shown with our 8" Beeswax Taper Candles, sold separately. Slightly imperfect, sold as is only. Factory seconds are non-refundable. Please note that no coupons, discounts or other offers may be combined with the factory seconds pricing. Since we are selling these items at a loss, all sales of Factory Seconds are final. Imperfections are cosmetic in nature. Glass options for Factory Seconds Hurricane Lamps will vary based on which glass seconds are available. If your choice of glass is not available as a Factory Second, we will contact you. This stunning candle stand is cast of solid brass with a heavy pewter plating. Features glass hurricane globes for added elegance. What a beautiful centerpiece for your holiday table or mantle! Both heavy and generously proportioned, the total weight of the candelabra with the glass is 3 pounds, 5 ounces. The base diameter is 5 inches, and the overall height including the globes is an impressive 20 inches. It is widest across the top edges of the glass, spanning 15 inches from edge to edge. Without the hurricane glasses, the candle holder stands 13 inches tall at the center. The glasses add 6 to 9 inches of additional height, depending on your glass selection. 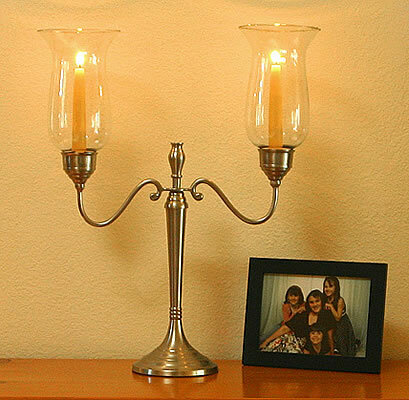 This candle holder is available in both Polished Brass and Pewter Plated finishes. This handsome pewter candlestand has a laquered finish to maintain a beautiful luster for generations. Includes glass globes.